Unfortunately, cleaning and sanitizing is part of the regular maintenance of every kind of water filter. Reverse Osmosis systems are no different. You can easily do it yourself following our easy instructions. Or you can hire someone to do it for you, if you don't feel up to it. But rest assured, it' s not that difficult. Why do I need to sanitize a RO System? 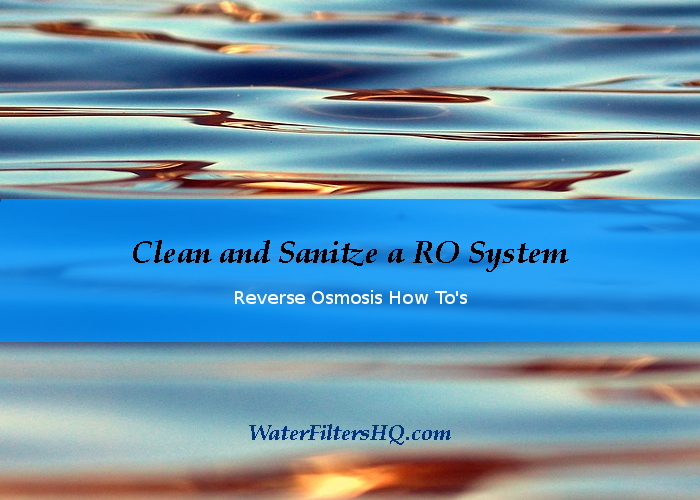 When should I clean my reverse osmosis filtration system? Most manufacturers recommend cleaning the RO system once a year. Some systems need a filter change only once a year, while others require more frequent changes. If your water filter is in our list of the best reverse osmosis filter systems, we mention filter change intervals. Once you made up your mind, it's a good idea to look for your system's manual. If you can't find it, search for it online. Most water filter manufacturers publish their manuals somewhere on their websites. If not, send them an email and ask for the file. Once you have the manual, check if they have instructions that might help you. Then go ahead and buy all replacement parts you may need. That includes filters, RO membrane, and in some cases new o-rings or empty housings. And if your system came with a special housing wrench, find yours or get a new one before you start. Additionally, you need a special sanitizer or unscented(!) bleach (usually cheaper). A pair of sanitation gloves to protect you skin from the bleach might also be a good idea. Clean the place you will be working on from dust and clutter. Get the new filters (and membrane), but do not unpack them yet. Turn off the water supply that leads to your RO system. Wash your hands thoroughly with soap and / or put on the gloves and eye protection. In case you have it connected to your refrigerator, disconnect it. Drain all water from the system and tank by opening your RO faucet. Once it is empty, close the RO faucet. Start with the pre-filter. That is the first one the water passes when it comes in. Open the housing and remove the old filter. Do the same with all filters installed before the tank, but leave the post-filter in place for now. That is the one after the tank. Screw empty housings (without filters) apart from the pre-filter back on. Pour sanitizer or unscented bleach into the pre-filter housing. and screw it on. Wait until the whole system is filled with water. That may take 5 - 10 minutes. Turn on the RO faucet to see if water comes out. If yes, turn if off again and also close the incoming water line. Now it is time to grab a of coffee/tea or take your dog for a walk. The bleach or sanitizer needs some time to do it's work. When using bleach, give it at least 30 minutes. For the sanitizer, check the package instructions. Open the RO-faucet to empty the system. Now flush the system by opening the incoming water supply for about 5 minutes. If the water still smells funny, let it run a bit longer until the smell is gone. Turn off the incoming water supply and leave the RO-faucet open to drain the system completely. Repeat the last two steps two times. Unscrew all housings, unpack new filters (and membrane) and install them. Turn the incoming water back on and check if there are any leaks. Within the next hours your tank will fill and your will have purified water again. In this video you see all the necessary steps using a set of special sanitation canisters. You can use your empty filter housing instead. Some people think, that if they use a water filter, the water that comes out is free of bacteria and viruses. So there would be no need to clean it. First, you have parts that come into contact with pre-cleaned water, pipes that lead to the pre-filter for instance. Over time a biofilm will form inside water pipes and even the filter housings. Biofilm is a mix of micro-organisms and their excretions. Well, that is just one reason why you should clean your filtration system. Another one is performance. You paid a lot of money for your RO system. And you want it to work. A growing biofilm can make it less effective or slow it down. If this did not convince you yet, there is one other reason. The filtered water maybe free of viruses and bacteria, to an extent that they are no longer traceable. But then it sits in the pipes or the tank for a while. And there is also the chance that the just cleaned water comes into contact with air that carries a whole lot of new bacteria. And if there is just a single bacterium or virus, they may replicate. The best time would be when a filter and membrane change is due anyway. Then you don't have to invest in additional filters. Your RO filter manual also may suggest an interval. If you are lucky, you still have running water during or after an emergency like flooding or a hurricane. But during and after these events, it is not uncommon, that the water quality is compromised. It may just be discolored or full of chemicals. Who knows? This water will then flush your RO unit with all sorts of chemical and biological contaminants. Much more than usual. If that happens to you, cleaning and sanitizing the whole system is a probably a good idea. And if it was submerged, there is no way around it. The only way to avoid this, is to disconnect your water filter from the incoming water pipe before the water quality decreases.